Glad to receive yours, posted the 6th. We will send the picnick basket to you and you send the jacket back to us. 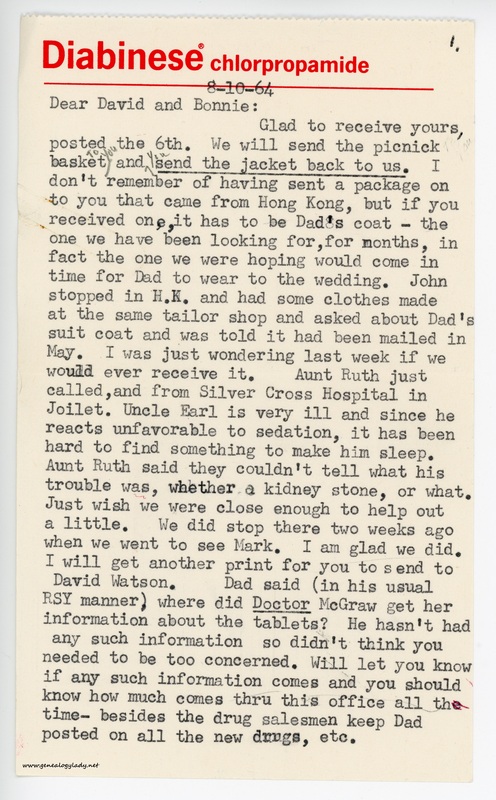 I don’t remember of having sent a package on to you that came from Hong Kong, but if you received one, it has to be Dad’s coat – the one we have been looking for, for months, in fact the one we were hoping would come in time for Dad to wear to the wedding. John stopped in H.K. and had some clothes made at the same tailor shop and asked about Dad’s suit coat and was told it had been mailed in May. I was just wondering last week if we would ever receive it. Aunt Ruth just called, and from Silver Cross Hospital in Joilet. Uncle Earl is very ill and since he reacts unfavorable to sedation, it has been hard to find something to make him sleep. Aunt Ruth said they couldn’t tell what his trouble was, whether a kidney stone, or what. Just wish we were close enough to help out a little. We did stop there two weeks ago when we went to see Mark. I am glad we did. I will get another print for you to send to David Watson. Dad said (in his usual RSY manner) where did Doctor McGraw get her information about the tablets? He hasn’t had any such information so didn’t think you needed to be too concerned. Will let you know if any such information comes and you should know how much come thru this office all the time – besides the drug salesmen keep Dad posted on all the new drugs, etc. [page 3] thinks one has to believe literally every word – which proves she hasn’t read too extensively on the matter – ) had a fit – in the words of her son when they took the study book home for her to read. My class members, Pat and Keith Alberts, were a little upset about the reaction of his mother and I think she has had some influence on their thinking. The sad part is, it is such a good book and has a message so timely, but I think she has bogged down because she has been impressed about the parts she doesn’t agree with and can’t see what the book is trying to say. However, I haven’t detected the same feeling from any of the rest of the class. If I thought you would have time to read the book, I would send you a copy. 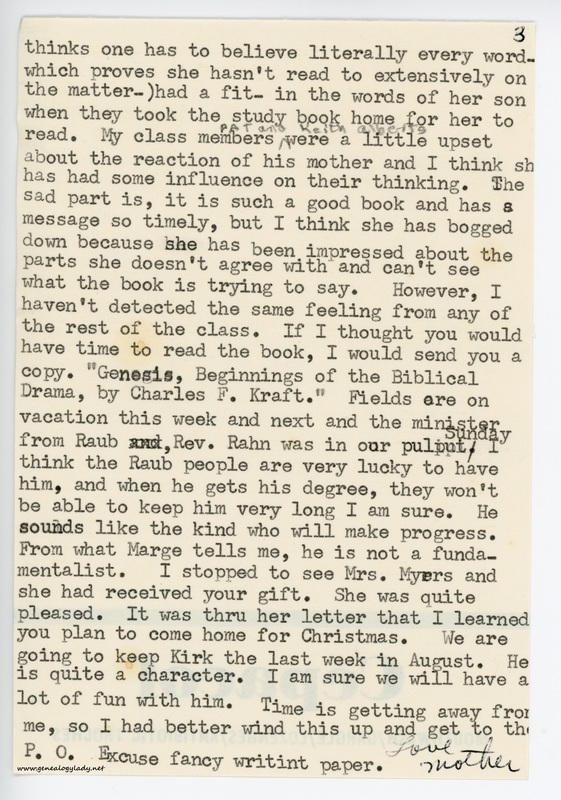 Genesis, Beginnings of the Biblical Drama by Charles F. Kraft. Fields are on vacation this week and next and the minister from Raub, Rev. Rahn was in our pulpit Sunday. I think the Raub people are very lucky to have him, and when he gets his degree, they won’t be able to keep him very long I am sure. He sounds like the kind who will make progress. From what Marge tells me, he is not a fundamentalist. I stopped to see Mrs. Myers and she had received your gift. She was quite pleased. It was thru her letter that I learned you plan to come home for Christmas. We are going to keep Kirk the last week in August. He is quite a character. I am sure we will have a lot of fun with him. Time is getting away from me, so I had better wind this up and get to the P.O. Excuse fancy writing paper. To read more about the presidential election of 1964 and Barry Goldwater, click here. 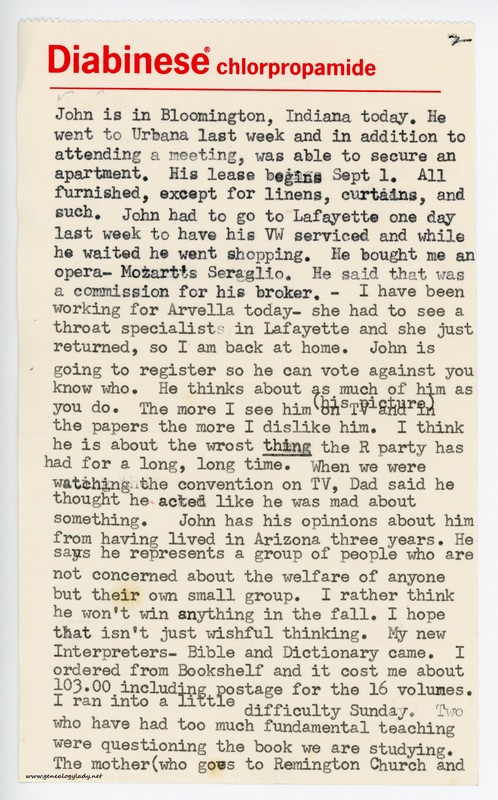 This entry was posted in Genealogy, Yegerlehner and tagged 1960s, Arvella Wright, Barry Goldwater, Boston, David A. Yegerlehner, David Watson, genealogy, Gladys R. (Foster) Yegerlehner, Indiana, John Earl Mutchler, John F. Yegerlehner, Keith Alberts, Kentland, Mark A. Yegerlehner, Massachusetts, Pat Alberts, Roscoe S. Yegerlehner, Ruth E. (Yegerlehner) Mutchler, Ruth M. Myers on January 6, 2017 by Deborah Sweeney. “I will get another print for you to send to David Watson.” My correspondence with David Watson was going strong at that time. I let it lapse at the time of the divorce, then resumed it after we moved to NYC. “My new Interpreters Bible and Dictionary came. I ordered from Bookshelf and it cost me about $103.00 including postage for the 16 volumes.” Her original set she had given to me. I write about this too in my book. “Genesis, Beginnings of the Biblical Drama by Charles F. Kraft” Hmmmm, I’ll have to look for than on Amazon.